I figured I post this up for you guys that want an affordable 12.5V 47A capable power supply to power your chargers. 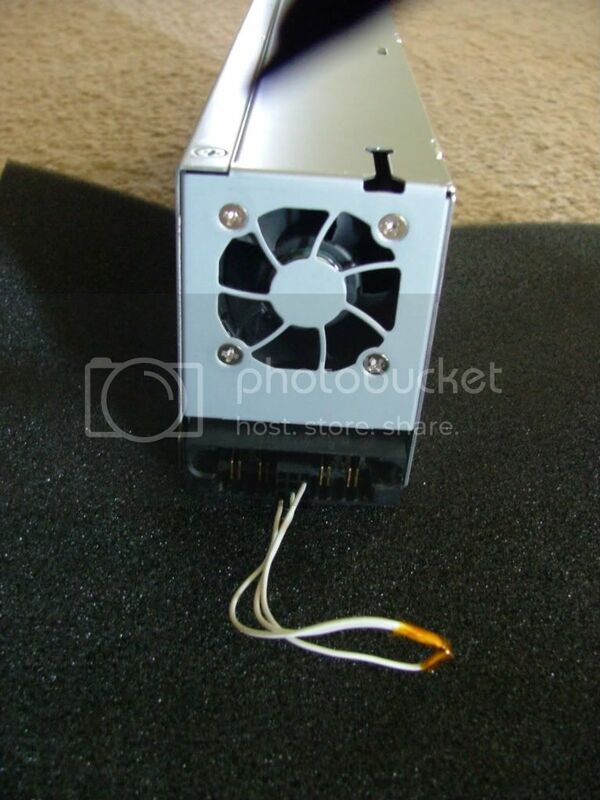 The model number is power supply in question is 321632-001, DPS-600PB HP 575W Power Supply Proliant DL380 G4. 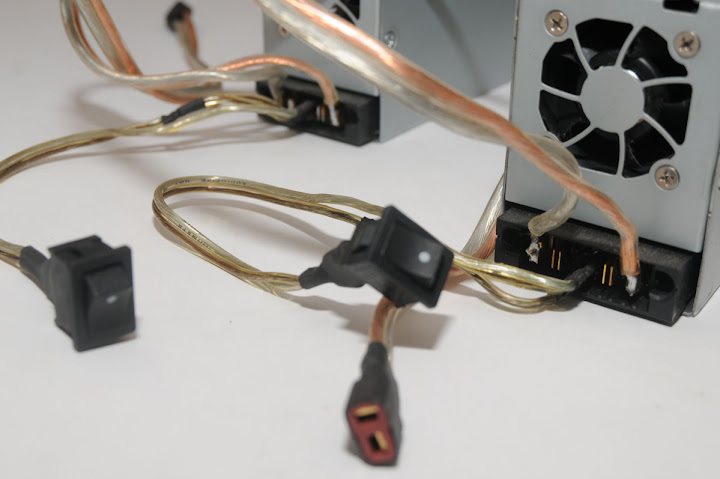 All you need to do for the PSU to "Turn on", is short 3 connectors. Basically two hot wires to ground. No load resistor is needed. 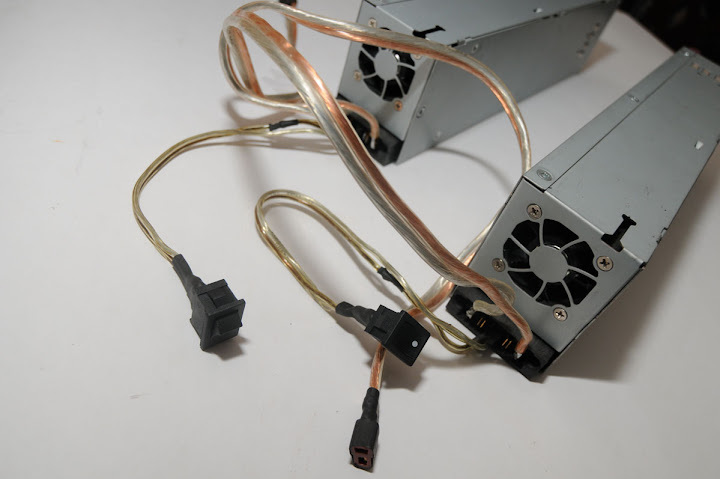 When you look at the back of the PSU, you'll find 4 blade plugs. The two on the left are ground and the other two on the right positive. In between the blade plugs, you'll find a set of 12 pin connectors. You'll see a pin that is shorter than the rest, which I call pin 6. Connect 6 and 10 to 8(ground). I believe pin 5 is ground as well. Note that the PSU fan will turn on when you connect it to the AC line. The fan will speed up, once you short the 3 pins together. I opted for plugs to the pins, but you can use a switch instead. 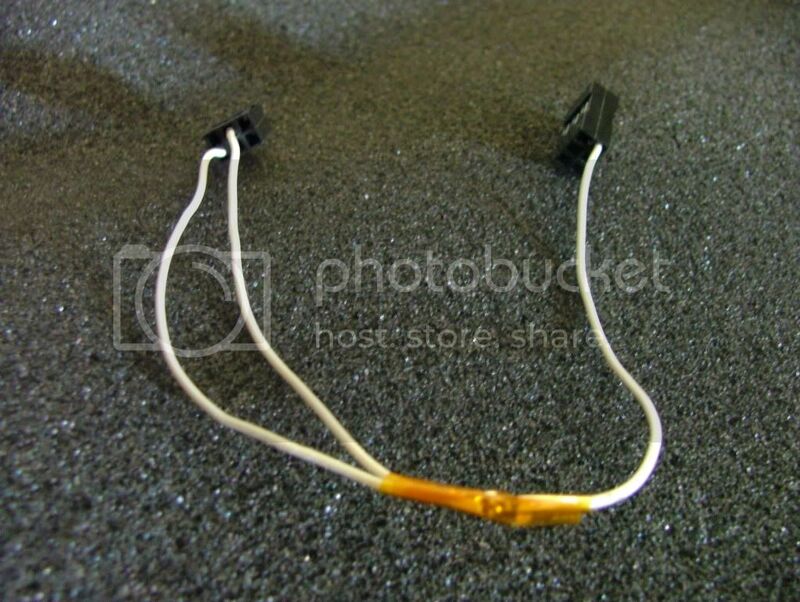 You can use servo leads as well. Solder your power wires to the blade pins and have fun charging. Did basically the same thing with a 47amp server p/s. Only had to jump 2 pins on that. Works great, I have 2, 1 as a backup. Only paid 20 bucks each. Nice thing about the one you linked is that it takes a std pc power cord. i had to hardwire mine. Last edited by lincpimp; 07.15.2010 at 05:41 PM. Naah, I haven't bothered opening it up. I wanted something simple and cheap. A regular ATX is too much work compared to this PSU. 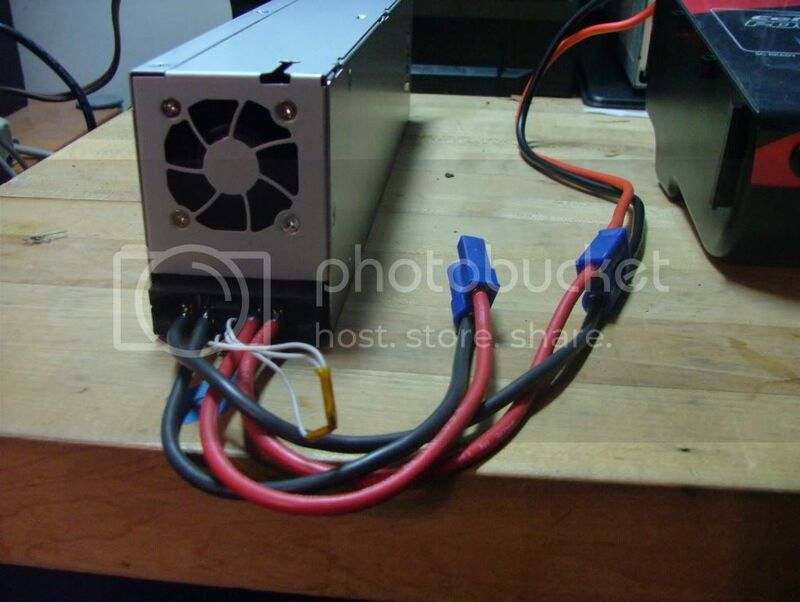 I will ask at work if boosting the voltage is even feasible with this PSU. I have no schematic of what the other pins do. I was pulling 25A last nite out of the PSU and the charger stated 12.8V@25A. When I get a few more, I'll open one up. I got one of these coming. $14.99 w/free shipping. How can I go wrong. Great post!! Great to see fellow members with this PSU. You can't beat 15 bucks hey Jhautz. is it possible to put two of those psu's in series? 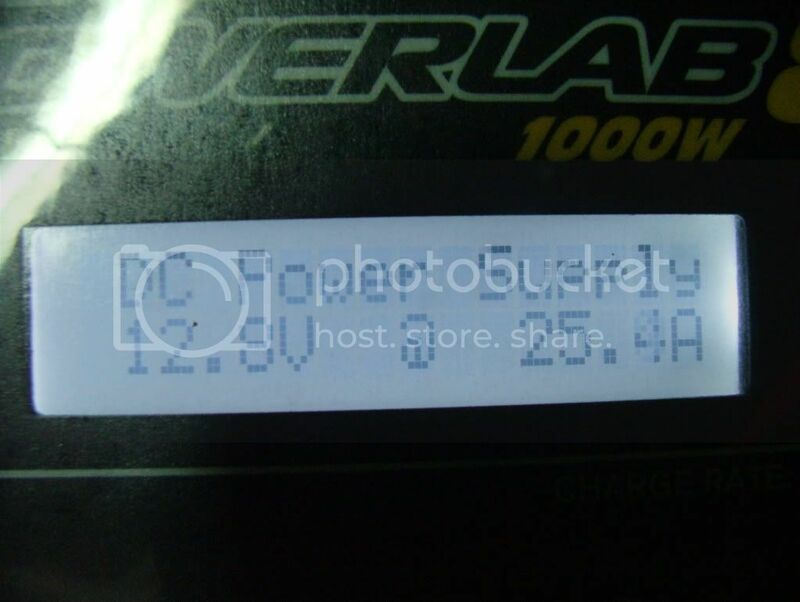 i am thinking about getting a icharger 3010 (1000w) and it supposedly runs best on 24v. It can be done, but at a big, big, big risk... I would not advice it... you will need to remove the wall 'ground' on at least one of the supplies (if you don't, they will shot down when you try to connect them)... if this is done, the metal case will be 'energized' (a technical person can step in here)... meaning if both cases were to be come in contact, you will have a big spark/short... I tried with one ground removed and both grounds removed... you can actually measure the voltage between the two cases when both grounds are off (12v). Yeah, you don't want to remove the grounds because then if the case starts "floating hot" due to some malfunction or whatever, you have no protection against electrocution. But it's not just the grounds. The neutral wire is electrically the same point as the ground wire in the electrical box. so, as long as i don't let the cases touch, it should be fine? i would likely mount them securely on a shelf with about 6 inches between them. i was already aware of the case being grounded on most PSUs. i found out on my own the hard way. it's a good thing the specific PSU i was using had a built-in short protector circuit thing that shut it down and wouldn't turn back on until after i unplugged it and plugged it back in. Yup as long as they don't make contact, you should be able to wire them in series. I personally am not going to do it. You never know what will happen with small kids around. I go mine in the mail today. It's alot smaller than I thought it would be. I have a 30A ps from a server that I have been using for a few years and it's 3 times the size of this one. I'm pleasantly surprised if it delivers the amps it's rated for. I got the power supply to shut down when my charger was pulling 50A from it. Unplugged the PSU and it's up and running again. This time I set my charger at a 47A limit. I'll see what happens.